A rejuvenated Roger Federer is committing to a full schedule in the second half of the season, saying that he’s had enough of practice and is hoping to quickly recapture his stunning early-season form. 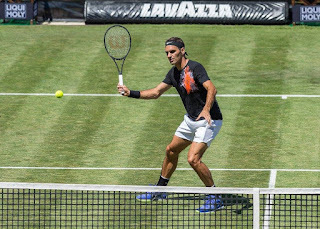 Fresh off a two-month break to rest his 35-year-old body, Federer returns to the ATP World Tour this week at the grass-court event Mercedes Cup in Stuttgart. After an unpredictable first half of the season that now sees Rafael Nadal and Federer in first and second place in the ATP Race To London, the Swiss said that he remains surprised at how the season has unfolded. When Andy Murray and Novak Djokovic played a pulsating final in Doha in the first week of the season, most tennis fans thought that last year’s No. 1 and No. 2 finishers would wage a two-man battle for the year-end No. 1 ATP Ranking again in 2017. So far this season it has been a two-way battle for year-end No. 1 between Federer and Nadal, The Spaniard has now firmed as a strong favourite following a dominant clay-court swing that included titles No. 10 in Monte Carlo, Barcelona and Roland Garros, as well as a fifth crown in Madrid. But Federer will hope to close that gap during the next five weeks on his favourite surface, grass. He’s playing the next two weeks in Stuttgart and Halle before taking a week off before chasing an eighth title at Wimbledon. “I was terribly surprised to win the Australian Open and to back it up and win the sunshine double in Indian Wells and Miami was a complete surprise to me,” Federer said. “I think Rafa winning the French Open is less of a surprise because he'd done it nine times before. I was hoping he was going to dominate the clay-court season like the old days. Federer readily admits that Nadal is a hot favourite to finish No. 1 for the fourth time, but says that the second half of 2017 promises to be much more competitive than the first half. “Obviously Rafa is in great position to finish World No. 1. For him it's going to be all about staying injury free. For me it's about getting back to winning ways, where I left off in Miami. Federer, a winner of 15 grass-court titles will meet German veteran Tommy Haas in the Mercedes Cup second round. The Swiss right-hander is competing at an ATP World Tour tournament for the first time since capturing the 93rd title of his career at the Miami Open (d. Nadal) on 2 April.